Our 4-seat standard electric golf carts are our most economically priced golf cart rental. Before delivery, our carts are inspected, washed, waxed, fully charged and ready for use! They are equipped with a dual safety bar on the rear-facing seat keeping your passengers secure and protected from sliding out. Your battery charger is mounted under the back seat easily accessible to plug in each day. Chargers automatically turn off once charged making them worry-free. Charge indicators on dash show the state of charge for your vehicle during the day. We provide a club lock for the vehicle to keep it secure while enjoying the beach or one of the many shops and restaurants in the area. 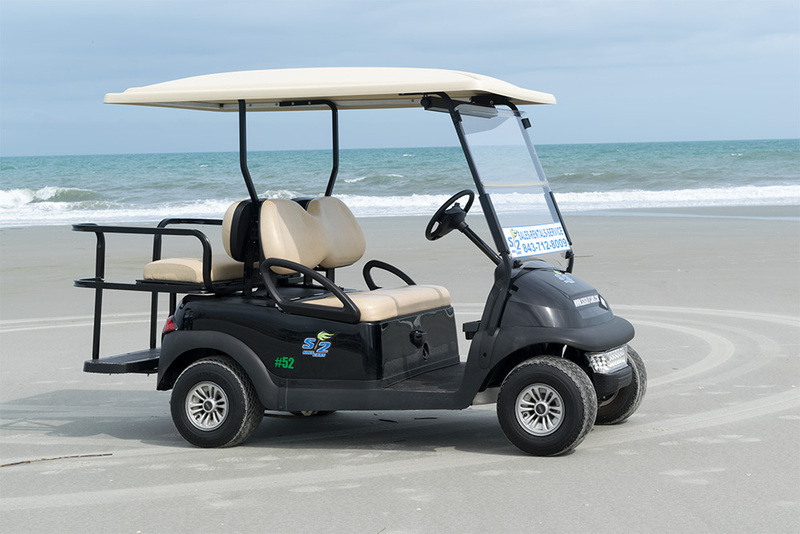 We guarantee our golf carts are the safest and most reliable carts in the Grand Strand! *Delivery options are available - depending on distance, additional fees may apply. Call (843) 712-8009 to reserve your golf cart today!